BMW has launched the X4 coupe-SUV in India with prices starting from Rs 60.6 lakh (ex-showroom India). In BMW India’s SUV portfolio, the X4 is positioned between the X3 and the X5. The X4 is not a traditional SUV but an coupe-SUV, like the BMW X6, which is already on sale in India. Since the X4 is smaller compared to the X6, it’s also more affordable. That should be a reason to cherish for buyers who have aspired for the X6 in the past for its styling, but couldn’t afford one. Talk of the features on offer on the X4 in India, and the list of standard safety features include six airbags (front and side airbags for driver and passenger and head airbags for front and rear), ABS, cornering brake control, dynamic stability and traction control, Isofix child seat mounts and tyre pressure indicator. Other significant standard features that enhance comfort and convenience, and add to the utility include adaptive suspension, adaptive LED headlamps, rain-sensing wipers, driving modes (EcoPro, Comfort, Sport), auto headlamps, mood lighting, auto-dimming and electrically foldable ORVMs, auto-dimming IRVM, auto tailgate, panoramic sunroof, a three-zone automatic climate control, front and rear parking sensors with rearview camera, and Apple CarPlay with wireless integration and wireless charging. The X4 xDrive20d M Sport X version is available with all the standard features mentioned above. Priced at Rs 60.6 lakh (ex-showroom), this version is equipped with a 2.0-litre diesel engine that makes 190PS of maximum power and 400Nm of peak torque. This engine comes paired with BMW’s 8-speed Steptronic automatic transmission, and the powertrain is capable enough to propel the X4 forward with enough grunt to take it past the 100kmph mark in flat 8 seconds (BMW’s claimed figure). The X4 can do the 0-100kmph stint in 6.3 seconds as well, but that version is powered by a 2.0-litre petrol engine. In the X4 xDrive30i M Sport X, this engine makes 252PS of maximum power and 350Nm of peak torque. It is paired with BMW’s 8-speed Steptronic Sport automatic transmission. In this guise, the X4 can be had at a price of Rs 63.5 lakh. Other than the extra power on offer, the extra money you spend on the petrol-powered X4 also adds the following equipment to the package: Sport+ driving mode, launch control function, a 12.3-inch multifunction instrument display, M Sport brake with brake callipers in Dark Blue Metallic and M logo, a head-up display, 16-speaker Harman Kardon audio system (600W output compared to 205W output from 12 speakers on the standard X4 xDrive20d M Sport X), Navigation System Professional (includes a 10.25-inch display that is bigger than 6.5-inch display on xDrive20d, 3D maps, touch functionality, better screen resolution, iDrive Touch with handwriting recognition and DVD drive). The petrol X4 can also be had with red-black upholstery, which is not available on the xDrive20d. So, the premium of nearly Rs 3 lakh that you spend on the petrol X4 not only makes your ride go fast, but also adds some equipment that will make the overall ownership experience more satisfying. Not that the xDrive20d misses out on anything basic, but still. If you’re still looking for more power, there’s another version of the X4 for the taking - the X4 xDrive30d M Sport X which costs Rs 65.9 lakh (ex-showroom). The additional Rs 2.4 lakh that you pay for this variant buys you a 3.0-litre, inline-six diesel engine that will make the X4 quicker by 0.3 seconds. That’s because it’s got 13PS more power and a whopping 270Nm more torque when compared to the petrol engine. The package remains the same as far as equipment is concerned, but if you want your X4 in metallic black exterior colour, it can only be had in this version. No wonder body wraps are so popular these days! What exactly is M Sport X? 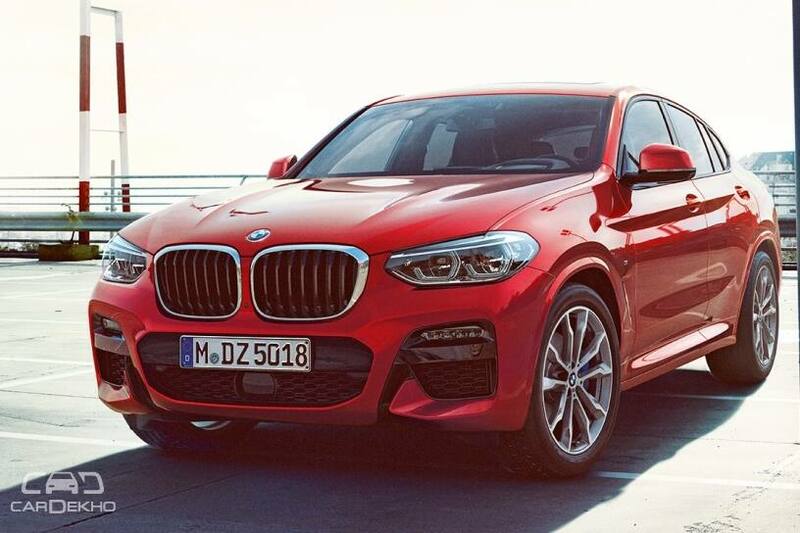 Apart from the black exterior colour, which can only be had with the X4 xDrive30d M Sport X, the other colours on offer include red, blue and white. The X4 is assembled in India and will be joined by a smaller coupe-SUV, the X2, in future. So if the X4 is out of your reach, then the X2 might just be the perfect coupe-SUV styled BMW you’re looking for.